Passchendaele Society members are invited to the 2017 AGM which will be held at the Auckland War Memorial Museum Auditorium at 5.00pm on Thursday 30th March. This is, of course, a very significant year and the Board is hoping that as many members as possible will attend. Immediately following the AGM there will be a presentation on the progress with our NZ Memorial & Garden at Zonnebeke, which we are sure members will find most interesting. Please put the date in your diary. Please enter via the Atrium (South) entrance (not the Grand Foyer by the Cenotaph) and the staff will direct you to the lifts and the appropriate floor. Formal notice will be sent out nearer the time. There are potentially two Board vacancies this year. Members who wish to nominate another member for a Board position in the 2017-18 year are reminded that written nominations, accompanied by the written consent of the nominee and a brief ‘CV’, must be received by the Secretary not less than fifteen (15) clear days before the date of the Annual General meeting, ie by 14th March 2017. Also, you will be receiving an invoice shortly for your annual subscription renewal. The fee remains at $20 per person. It would be very helpful to our Treasurer, Mike Hartley, if you could please pay this promptly. If you wish to take the opportunity to take up Paid Life Membership then the once-off subscription is currently $250 per person. Subscriptions can either be paid by cheque, by post or by Bank Transfer, or at the AGM (but preferably beforehand). Please remember to advise our Secretary (see below), of any changes in your personal data so that you continue to receive all our communications. A significant number of New Zealanders are being sought for the planting of a tree in a tree-planting ceremony in the new Polygon Wood of Peace. In 2017, a tree will be planted for each fallen soldier buried at Polygon Wood. There are two massed plantings planned: 26th September (mainly for the Australians) and 12th October (mainly for the New Zealanders). 531 New Zealanders are remembered on the Buttes New British Cemetery (N.Z) Memorial or lie there in the two cemeteries (Polygon Wood Cemetery and the Buttes New British Cemetery). The Wood of Peace will keep the memory of those who lost their lives during WW1 alive for many generations to come. Please note the actual time of the plantings are still to be confirmed and is being coordinated by the New Zealand Embassy in Belgium. However it will link in nicely with the other planned ceremonies such as the opening of the New Zealand Memorial & Garden at Zonnebeke and the commemoration at Tyne Cot Cemetery. We will keep you informed when we have firmer information. 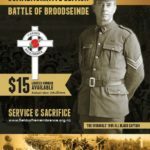 You can register your interest here http://passchendaele2017.org/en/evenementen/plantdag-vredesbos/ In the comments box, please put that you are a member of the NZ Passchendaele Society. The New Zealand Memorial & Garden is being created in remembrance of the more than 5,000 New Zealanders who were killed or mortally wounded in Flanders, Belgium. Most still lie in the surrounding Flanders Fields, others made it over to the border of France only to die at a later date in a Field Dressing Station or hospital and are thus buried in French soil. The ‘darkest day’ in New Zealand’s military history is specifically incorporated in the Memorial & Garden design commemorating 12th October 1917 when 846 New Zealanders were killed and 2,700 wounded during the attack on Bellevue Spur. We are well on course with the installation of the New Zealand Memorial & Garden at the Zonnebeke Chateau. There is a Loading of the Containers ceremony & blessing currently planned for Tuesday 7th March. Date, times and logistics are still being finalised but I thought it worth a mention here as part of the progress report. It is envisaged that all New Zealand-sourced items (bronze discs, basalt pavers, etc) will be shipped in 3 containers. The onsite preparation works will commence in April, once the ground has had a chance to begin to thaw. The bulk of our New Zealand boys over-wintered in the Armentieres sector, just south of the Belgian border. Reorganization of the 1st and 2nd Brigades took place on January 1st, 1917, when the 1st Canterbury and 1st Otago Battalions went from the 1st Brigade to the 2nd Brigade and the 2nd Auckland and 2nd Wellington Battalions were transferred from the 2nd Brigade to the 1st Brigade. From now onward to the Battle of Messines (which started June 7th), the Battalions worked together, relieving each other in the frontline near Armentieres at regular intervals. The battalions settled down to regular reliefs of eight days in the line and eight days in billets in the village of Sailly. Luckily the Sailly Sector (France) was a relatively quiet sector of the frontline. Reinforcements arrived steadily, and the battalions rapidly came up to strength again. They were also put to work making preparations for the Battle of Messines (Belgium). Meanwhile, Allied plans in 1917 aimed to keep the pressure on the enemy with a series of offensives on the Western Front. The first, in April, at Arras, when the Canadians captured the Vimy Ridge. In this operation, New Zealand tunnellers provided valuable support, expanding tunnel systems under Arras and opening up shafts to facilitate the attack. The tunnels can still be visited today. Also FYI a little more – on February 9th the German Forces retreated to what they called the Hindenburg Line, the withdrawal was completed 5th April, leaving behind a devastated territory. And on 6th April the United States declared war on Germany. If you are planning at being at the commemorations in Belgium on October 12th 2017 and have not yet let our Secretary know, then please do so. The New Zealand Embassy in Belgium is coordinating events and the final program will soon be finalised. The ceremonies are intended primarily for New Zealanders and at this stage, will not be ticketed. There will be several coordinated events at several locations with a full day planned. Shaun Fogarty from the New Zealand Embassy has informed us that the Menin Gate Ceremony on October 11th will be focused on New Zealand. Please note the official opening of our New Zealand Memorial & Garden at Zonnebeke Chateau may now be on October 11th (tbc) so at this stage you should plan on being in Ypres by the 11th! There are ticketed events in Flanders (in case you are planning to be in the area at the time):- Sunday 30th July 2017 Last Post Ceremony at the Menin Gate in Ypres to mark the start of the Passchendaele Offensive (tickets only); and Monday 31st July 2017 Tyne Cot (tickets only) https://www.gov.uk/government/news/they-called-it-passchendaele-government-unveils-plans-to-mark-centenary-of-the-third-battle-of-ypres There will be large screens available for those who are unsuccessful in winning the free tickets. ANZAC Day sees a Dawn Service at 6.00am at the Buttes New British Cemetery in Polygon Wood followed by breakfast in the OC ‘t Zonnerad café in Zonnebeke; the same day sees a mid-morning New Zealand ceremony in Messines; there is also an official commemoration at the New Zealand Memorial park in Messines on June 7th; the commemoration in Arras will take place on April 9th; and there will also be an Australian service on 26th September 2017 at the Buttes New British Cemetery. This website is an excellent source to stay abreast of any developments in Zonnebeke/Passchendaele http://passchendaele2017.org/ Also the http://thebelgianshavenotforgotten.blogspot.co.nz/ is a great source of information.